While John Wick director Chad Stahelski is already booked to return for the 2019-scheduled John Wick: Chapter 3 and has burgeoning prospects for a movie reboot of Highlander, it appears that a most intriguing comic book movie project in Kill or Be Killed has landed on his backlog. 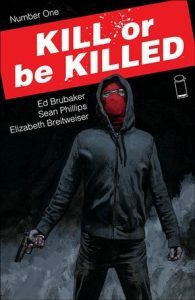 Stahelski will reportedly reteam with repertory John Wick franchise producer Basil Iwanyk to adapt Image Comics’ Kill or Be Killed as a film for Columbia Pictures, according to THR. The comic series centers on the supernatural ordeal of protagonist Dylan, a depressed graduate student who attempts a building-leaping suicide over the lament of a failed love affair. However, an opportunistic demon catches existential wind of the act and saves Dylan’s life, but locks him into the sinister caveat of having to earn each month of his life with a murder. Consequently, Dylan – deciding that he wants to live – exploits a moral grey area by fulfilling this sacrifice as a masked gun-wielding vigilante. Kill or Be Killed is a comic extravaganza of ultraviolence worthy of the John Wick auteur. Showcasing the art of Sean Phillips, the series is the creation of acclaimed writer Ed Brubaker, who staked his claim to comic book fame with early-2000s offerings exploring Batman with DC Comics, along with Marvel runs on Uncanny X-Men and Daredevil. However, with his reinventing run on Captain America, starting back in 2005, Brubaker became notable for making what arguably became the biggest retcon in comics history, reviving the hero’s long-dead sidekick Bucky Barnes as the brainwashed, cybernetically enhanced Winter Soldier. It’s a concept that would be famously adapted in the Marvel Cinematic Universe as the central story of 2014’s Captain America: The Winter Soldier.